Wait…hold on. You aren’t supposed to trust a SEO firm that guarantees SEO results, right? Wrong. This notion started when Google stated that no firm could guarantee a specific placement for any one keyword, as that would imply a special relationship with Google (which no SEO firm has). Unfortunately, the SEO industry has used this as an excuse to shy away from any accountability. We believe that it is possible to guarantee results—and we do it every day here at Juicy Results. Guaranteed SEO is what the market has been waiting for: an affordable program that will bring you multiple page one rankings on a consistent basis. Juicy Results is the clear choice for a small business that wants to aggressively market the business through search traffic. 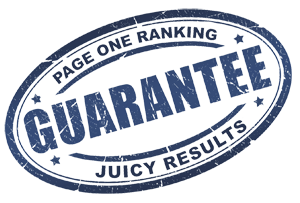 Before you engage Juicy Results in a SEO program, we will agree upon a guaranteed number of page one listings for your website. We guarantee that you will achieve at least as many page one Google rankings for keywords that we agree are believed to drive relevant, income-generating traffic to your website. If we do not reach this milestone by the sixth month of our relationship, we will provide those services for free until we do. There is some fine print, mostly ensuring that the rules are fair for both sides, but that’s the guarantee in a nutshell. Call us today to get started or fill out this form! We have multiple packages that can help you dominate the search engine rankings in your market. Starting at $2,000 per month, our packages are based on the amount of content we will be creating for you and the number of keywords we will be targeting. The first step is to contact one of our Internet Marketing Consultants to discuss your industry and needs. Fill out the form on this page or call us today! In the fall of 2014, we celebrated our one year anniversary of the Guaranteed SEO program. Within three months, we had some very impressive page one rankings for national keywords that we were targeting.